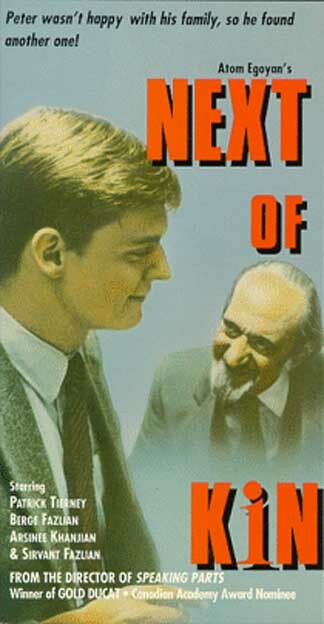 Excellent!, 12 November 2001 Author: Xenoid (xenoid@yahoo.com) from Watertown, MA Atom Egoyan proves early on his talent as a story-teller in this 1984 Drama/Comedy about a man searching for an identity. The premise is a lot like that of The Graduate, a young man not sure where is future lies, although the way they go about it is completely opposite, the beginning definitely reminds me of "The Graduate"Peter Foster is a 23 year old man still living with his controlling parents. With no ambition in his life, the Foster family visits a therapist, hoping that they can be helped. While viewing the video-recording of his therapy session, he puts in another tape of an Armenian family seeking therapy. It is revealed that this Armenian family had given up a son for adoption early on. Peter comes up with a plan where he will "pretend" (a theme which comes up often in the film) to be Bedros, the long lost son of this elderly couple. The story is told well, in the trademark Egoyan style. The film mixes comedy with drama, containing beautiful artistic elements that we can definitely associate with Atom Egoyan. The simple fact where there are no subtitles is interesting in itself, because Peter doesn't know what is being said, why should the audience? (Although this is only a few seconds here and there, it doesn't take away at all from the film) If you are a fan of Atom Egoyan I highly recommend seeing this film, enjoy!